- Exceptional visit of Drikung Kyabgon Chetsang Rinpoche, head of the Drikung Kagyu tradition, May 29th 2014. - Drubpon Tsering Rinpoche, retreat master of the Drikung Kagyu tradition, June 7th-9th 2014. 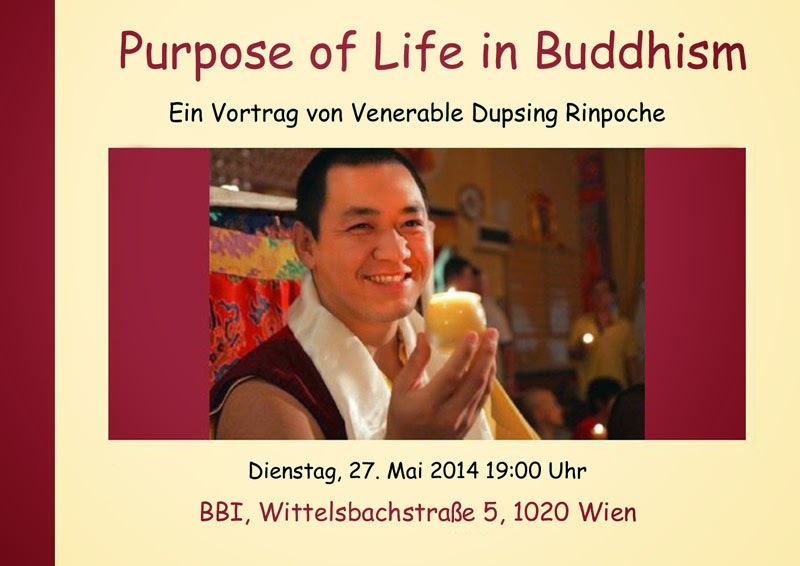 The experienced Buddhist master Dupsing Rinpoche will give a public talk about the "Purpose of Life in Buddhism" at the Federal Institute for the Blind (Bundes-Blindenerziehungsinstitut, BBI). Rinpoche is a reincarnate Lama of the Karma Kagyu tradition and received a thorough traditional Tibetan Buddhist education. Following extensive studies in Buddhist philosophy, Rinpoche earned a degree in Theology from the University of Cambridge. Later on, he also underwent a traditional retreat of three years and three months. - Lecture "Tibet - History and Buddhism from a Tibetan perspective", 7 p.m. to 8:30 p.m., Urania, Mittlerer Saal, 1010 Vienna , Uraniastraße 1. During this talk, H.H. will introduce the longstanding work on his book „History of the Tibetan Empire“. A short introduction will be delivered by Gerhard Weißgrab, president of the Austrian Buddhist Society. Advance reservation required - Further details are available here. 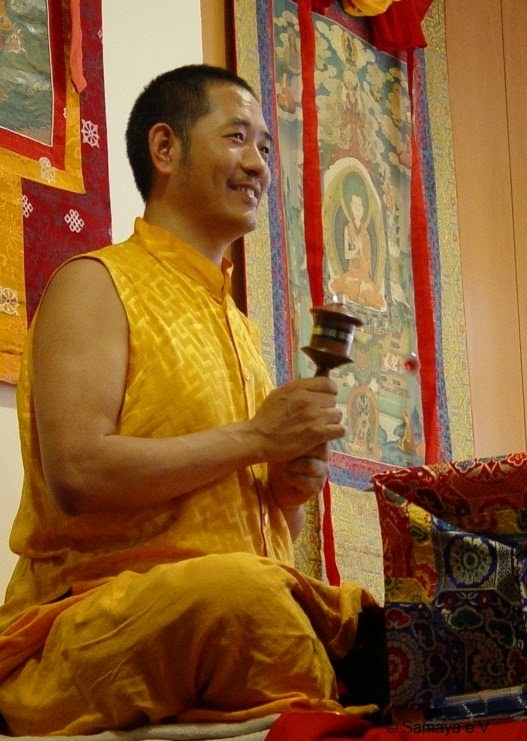 As I already anounced in a recent post, Drubpon Tsering Rinpoche will return already in June to continue teaching at the Viennese meditation group Samaya. The short course will start out with a public talk on Saturday evening about "Ways to Achieve Health and Happiness". The following program on Sunday will then cover instructions, empowerment and the practice of Medicine Buddha. Saturday 7.6 2014, Public talk on "Ways to Achieve Health and Happiness", 8 p.m. - 10 p.m.
Sunday, 8.6 2014, Medicine Buddha (refuge, empowerment and instructions), 11 a.m. - 6:30 p.m.
Venue: Seminarzentrum zeiTraum, 1070 Wien, Bandgasse 34/29c, second courtyard (! ), first floor.